I am glad to say that this summer’s sufferfest is over and I survived. 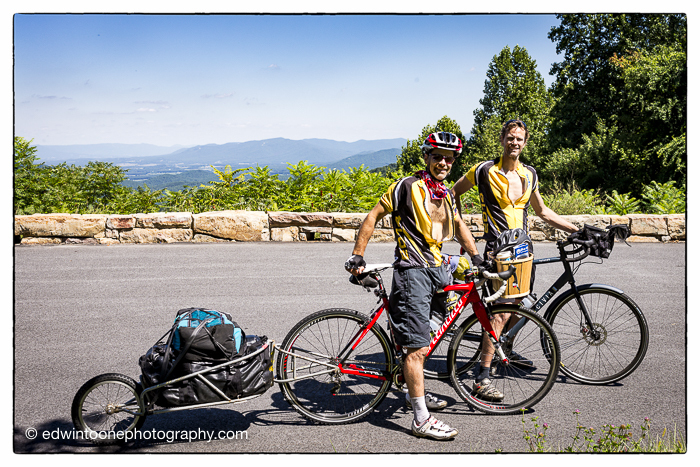 My old friend, Bill Irving had this great idea to ride all of Skyline Drive and the Blue Ridge Parkway. Our original plan was to do it with a group of people and a sag wagon but when that didn’t work out we set out on our own. Without the sag wagon we decided we wouldn’t have time for all the parkway but we could at least make it to Asheville to pick up a rental and head back north. At the last minute while packing we decided to throw in some climbing gear just in case we got the urge to do some climbing. Well the climbing ended up becoming a great distraction. Our total trip was around 14 days and we did a little over 500 miles or 800 kms, we climbed on the loaded down bikes over 59 thousand feet or 18 thousand meters and managed to do 8 different rock climbing routes.